"Sampath Speaking" - the thoughts of an Insurer from Thiruvallikkeni: Abe ~ Akita ~ Alina - Figure skating and more !! Abe ~ Akita ~ Alina - Figure skating and more !! Goguryeo was a Korean kingdom located in the northern and central parts of the Korean Peninsula and the southern and central parts of Manchuria. Along with Baekje and Silla, Goguryeo was one of the Three Kingdoms of Korea. Pyeongchang which was in news was part of this kingdom !. Pyeongchang carved out a name with the Winter Olympics 2018. At the opening ceremony, one thousand residents of Gangwon Province entered the stage, before standing in the formation in dove, holding lit candles. The enthusiasm of these particular individuals was very impressive. One of the biggest surprises of the night was the identity of the roster of famous faces that would sing in the centre of the Dove ~ who would alight the cauldron was also kept a secret. Of the many games, Figure skating was one – it is a sport in which individuals, duos, or groups perform on figure skates on ice. It was the first winter sport included in the Olympics, in 1908. The four Olympic disciplines are men's singles, ladies' singles, pair skating, and ice dance. The blade has a groove on the bottom creating two distinct edges — inside and outside. Judges prefer that skaters glide on one edge of the blade and not on both at the same time, which is referred to as a flat edge. During a spin, skaters use the "sweet spot" of the blade, formally called a rocker, which is the roundest portion of the blade, just behind the pick and near the middle of the blade. 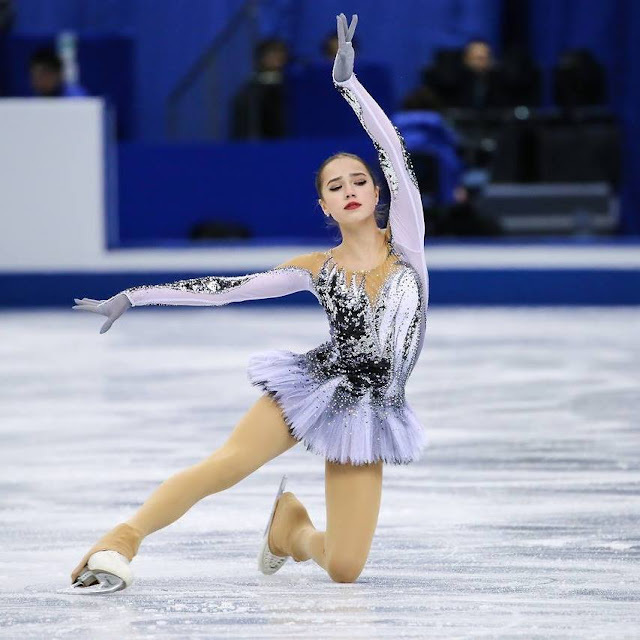 Russia’s 2018 Olympic champion in figure skating Alina Zagitova pledged on Sunday she will never follow the lead of her teammate and closest rival, Yevgeniya Medvedeva, and will never part with her coach Eteri Tutberidze. Welcoming Zagitova at the airport of her home city of Izhevsk, reporters asked her whether she could imagine herself changing her coach like other figure skaters do, she replied definitely: "No, I cannot even imagine that." Earlier in the month, Russia’s 2018 two-time Olympic silver medalist in figure skating Yevgeniya Medvedeva officially announced her decision to part with her coach Eteri Tutberidze and start working with Canadian specialist Brian Orser. It is not for the game alone, Alina is in news ~ she was in news as a recipient of a famous gift that too from the Prime Minister. Japanese Prime Minister Shinzo Abe, on a three-day visit to Russia, took part on Saturday in the handing over of an Akita puppy to Russian Olympic champion figure skater Alina Zagitova. Russian President Vladimir Putin said a solution with Japan had to be found to allow the two countries to conclude a World War II peace treaty which would reflect the interests of both. Putin had welcomed Japan's Prime Minister Shinzo Abe to Moscow on Saturday after meeting in Saint Petersburg for the economic forum, which Abe attended as a guest of honor. "Yesterday we discussed the advancement of economic and commercial ties" Putin said Saturday. The Japanese premier said he also hoped for a "new breakthrough" in settling the dispute that has festered for decades. Russian Prime Minister Dmitry Medvedev had sparked outrage in Japan when he visited the disputed territory in 2015. After meeting Abe, Putin said on Saturday that a Japanese business delegation would visit the islands this year. The dog breed in news ! ~ Akita is muscular, double-coated dog of ancient Japanese lineage famous for her dignity, courage, and loyalty. In her native land, she's venerated as family protectors and symbols of good health, happiness, and long life. Akitas are burly, heavy-boned spitz-type dogs of imposing stature. 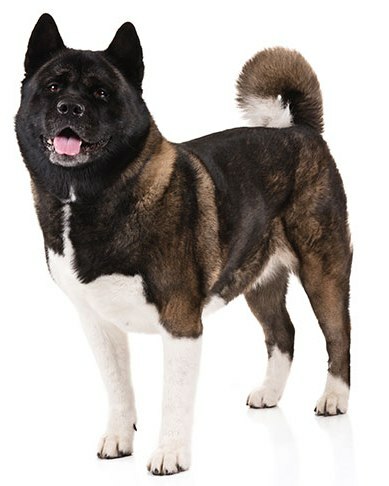 Standing 24 to 28 inches at the shoulder, Akitas have a dense coat that comes in several colors, including white. The head is broad and massive, and is balanced in the rear by a full, curled-over tail. The erect ears and dark, shining eyes contribute to an expression of alertness, a hallmark of the breed. Akitas are quiet, fastidious dogs. Wary of strangers and often intolerant of other animals, Akitas will gladly share their silly, affectionate side with family and friends. They thrive on human companionship. The large, independent-thinking Akita is hardwired for protecting those they love. They must be well socialized from birth with people and other dogs. Alina Ilnazovna Zagitova is a Russian figure skater who competes in the ladies' singles discipline. She is the 2018 Olympic champion, the 2018 European champion, 2017–18 Grand Prix Final champion, and the 2018 Russian national champion. Zagitova also won a silver medal in the team event at the 2018 Winter Olympics, representing the OAR team. In the free skating at the 2018 Olympics, Zagitova was the only competitor to perform all her (eleven) jumps in the second half of the program. This capitalized on the ISU scoring system, which awards a 10% bonus to jumps performed on "tired legs". Her combination jump of triple lutz–triple loop was technically more difficult and higher scoring than those performed by her competitors irrespective of where it appeared in the program. Russian Olympic figure skating champion Alina Zagitova received an Akita puppy Saturday from a group preserving the Japanese dog breed at a presentation ceremony in Moscow attended by Prime Minister Shinzo Abe. Zagitova plans to name the red-haired female Akita dog Masaru, meaning victory in Japanese, although the name is typically used for men in Japan. Zagitova fell in love with the breed while training in Japan before and during the Olympics and asked her parents to let her have an Akita puppy if she won the Games.